My original plan of covering the London Trip in only three blog posts seems to have failed. Ah well, it’s next to impossible to not go on and on about such a terrific city. Today we head to the south side of London for some strolling, some shopping, and some Shakespeare-ing. When Mr. Husband and I were sorting out what we wanted to do on this trip there were a handful of places we wanted to re-visit, but we also wanted new experiences (which is how we ended up taking a Roman excursion in The City, trekking up Hampstead Heath, and crossing underneath the Thames). Since I love the Graham Norton show, I tried to get tickets for the time we’d be in London, but apparently the Norton crew didn’t want a couple Americans in their building (who can blame them). 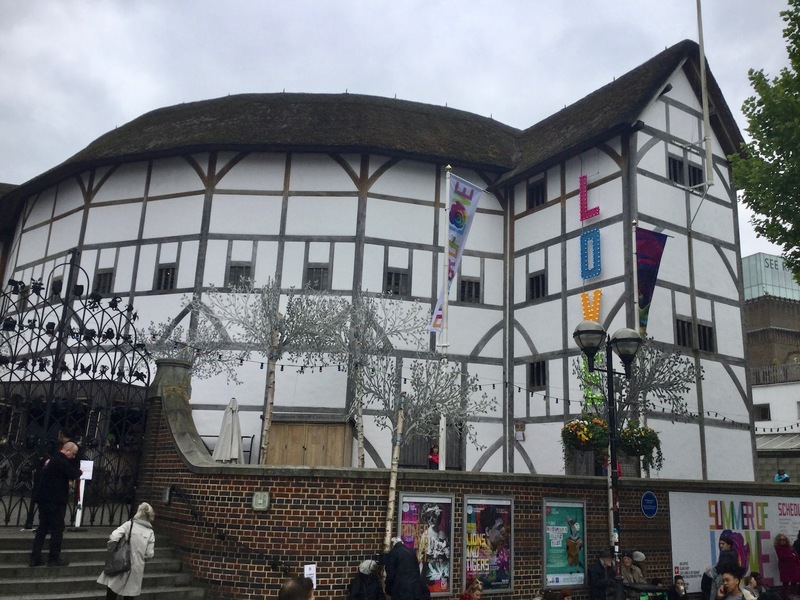 I was a little disappointed, but not terribly because I had been reading about the Summer of Love shows at Shakespeare’s Globe and was pretty keen on attending one even before our shameful rejection by Graham. 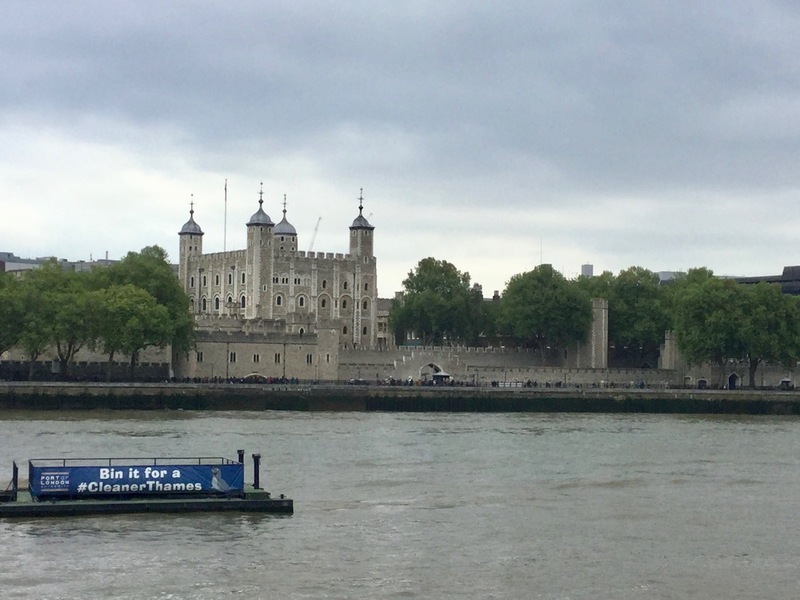 Since the theater (more on that in a bit), is on the south side of the Thames and since we had tickets for an afternoon performance, it made sense to make a day of it. As usual, the day started out with a few Underground transfers to get to the Blackfriars stop (we’re pretty sure they’re going to raise the price of the 7-day Travelcard after all our journeys!). A walk over Blackfriars Bridge delivered onto the south shore of the Thames. 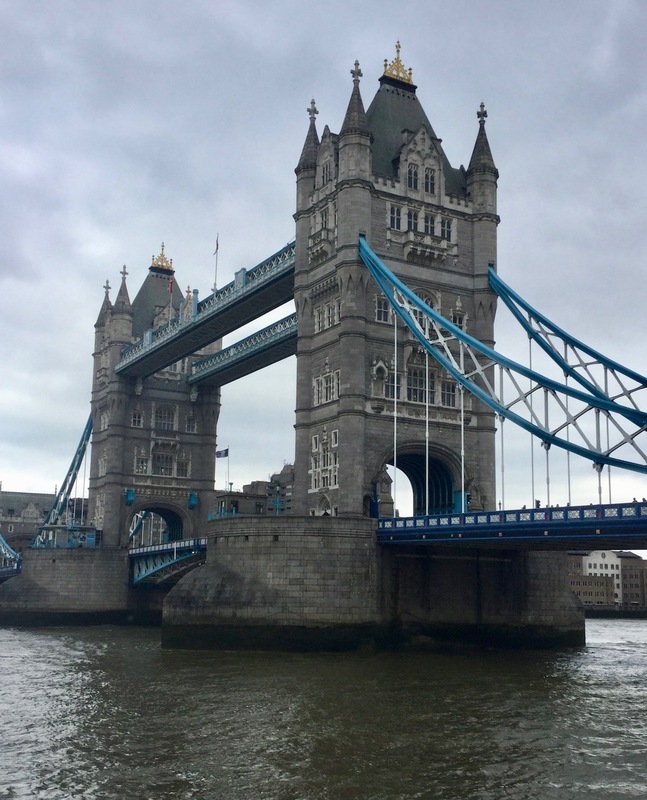 Of course we did the most touristy free thing possible: walk along the river to Tower Bridge, snap loads of photos, walk across it (taking more photos along the way), and then return to the south shore. Adventurous, I know! Don’t forget a few pictures of the Tower of London, as well! 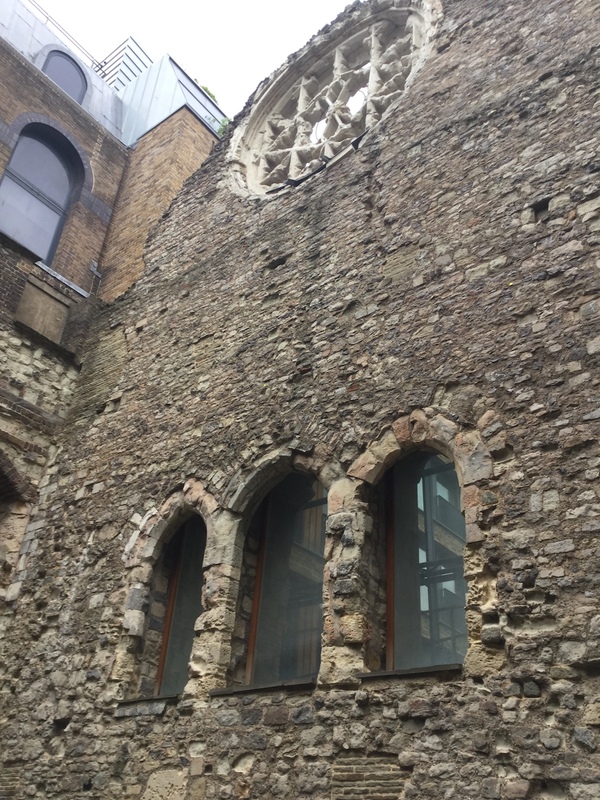 However, we did come across one thing I wasn’t expecting to see: a section of the now-ruined Winchester Palace. Don’t confuse this with Westminster Palace – that’s where Parliament hangs out. 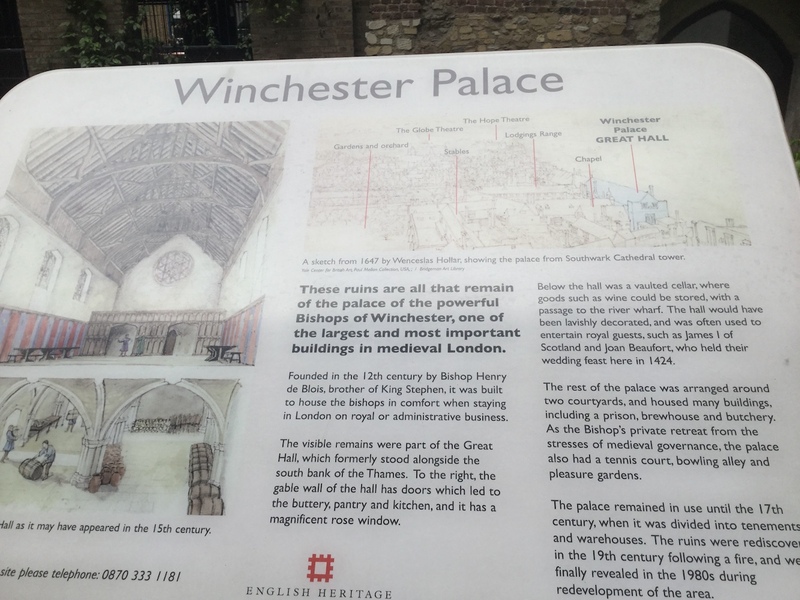 Winchester Palace was built in the 1200s for the Bishop of Winchester, not as a long term residence, but as a place for the bishop to kick back while he was in London – bishops need slightly better accommodations than a Holiday Inn, I guess. Since walking and taking pictures burns up tons of calories, it was time for lunch. Luckily, a food stop had already been planned into the itinerary, so there were no desperate dashes into Tesco’s bakery department this day. With overly full bellies, it was time for the theater. Okay, the current Globe is not the original one from Shakespeare’s day. That one, built in 1599, was demolished in 1644. However, the current Globe (built in 1997) is very close to the original theater’s location and is a pretty good reproduction according to people who know these things. 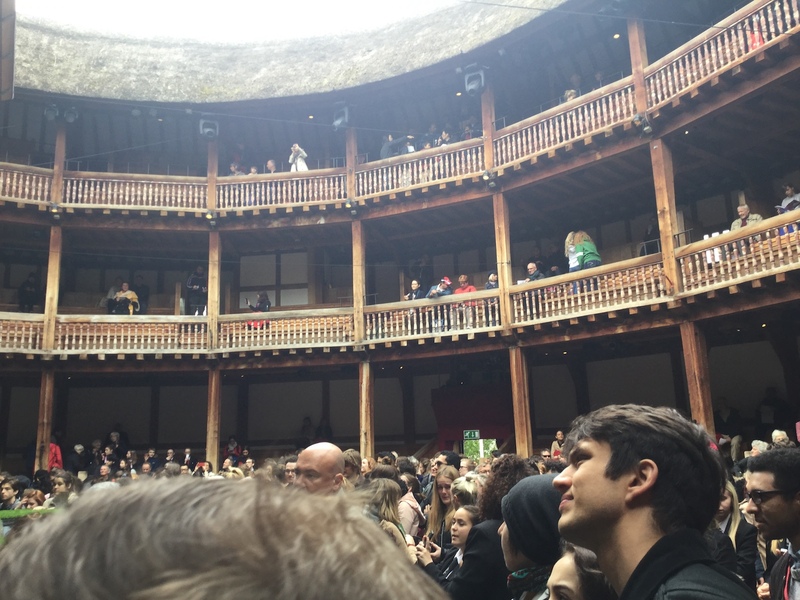 Just like the original theater, the Globe is open-air and has a semi-circle of three levels of covered seats ringing a central “Yard” and the stage. Now, if your legs can handle it, you can get tickets for the Yard for only 5 pounds (about $6.50 with today’s exchange rate). Why so cheap? Because you have to stand…in the elements…for the duration of the play. After I bought tickets online, I was a little worried about my plan. 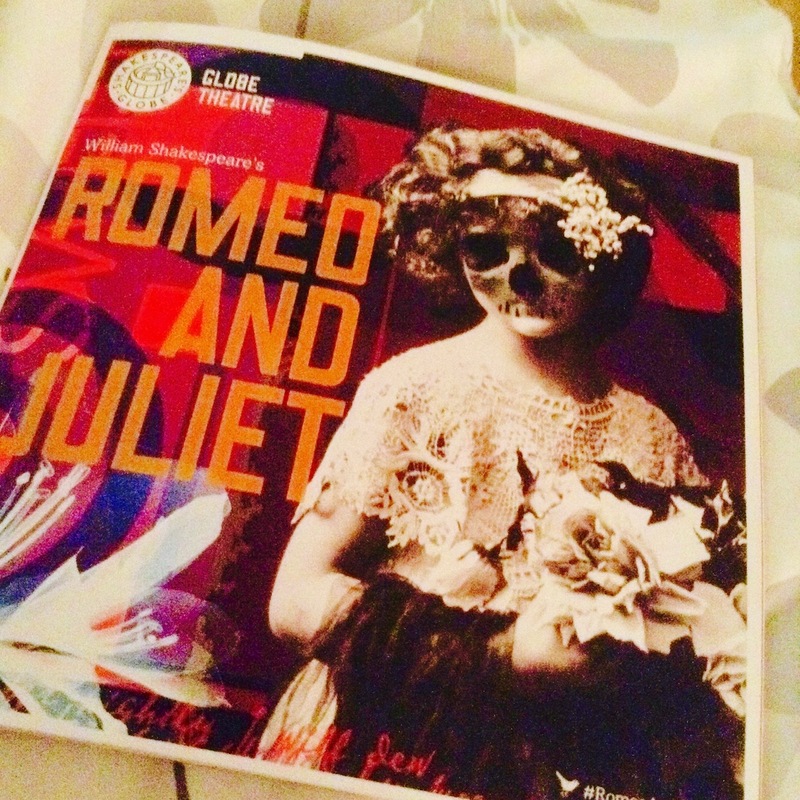 I kept seeing tidbits of the play (“Romeo & Juliet”) on the Globe’s Facebook page and it looked, well, weird. People kept mentioning the music – Mr Husband and I are not fans of musicals. And it was a big chunk of time when we could be off seeing non-ruined palaces. But we figured for 5 pounds, if we hated it after an hour, we could just leave. Because I wanted to be close to the stage, we showed up a little early and got in line (having picked up our tickets earlier in the day). Eventually we started shuffling in and I have to say, the inside of the theater is pretty darn cool. We even managed to get right up to the stage – which was good for leaning on when our legs got tired. All the world’s a stage, or at least this little piece of it is. A peasant’s view of the theater filling up. Okay, the play was a little weird, but in a good way. The setting is very modern which can sometimes take away from Shakespeare plays, but in this case it absolutely worked. They even managed to make several parts of the tragic tale funny (which I think helped hold Mr. Husband’s interest). Because the actors often come into the Yard for a little extra acting space, the peasants in the audience get to be up close and personal with Romeo and his buddies. At one point, Mercutio runs off the stage. She (yes, SHE) ended up planting a kiss on a schoolboy in the Yard (much to his embarrassment), then on her way back up the stairs, used the top of my head as her banister. That’s right, I played Banister #1…my Shakespearian debut!!! Hmmm, my name isn’t listed in here. Must be a misprint. Despite our earlier misgivings, we ended up so hooked on the play that we stayed (standing!) for the entire show. And I have to say it was one of my favorite things I did on this London Trip….and many other people agree according to the video below. After the play, it was time to sit by the river for and let our feet recover before heading back to the apartment. And you? 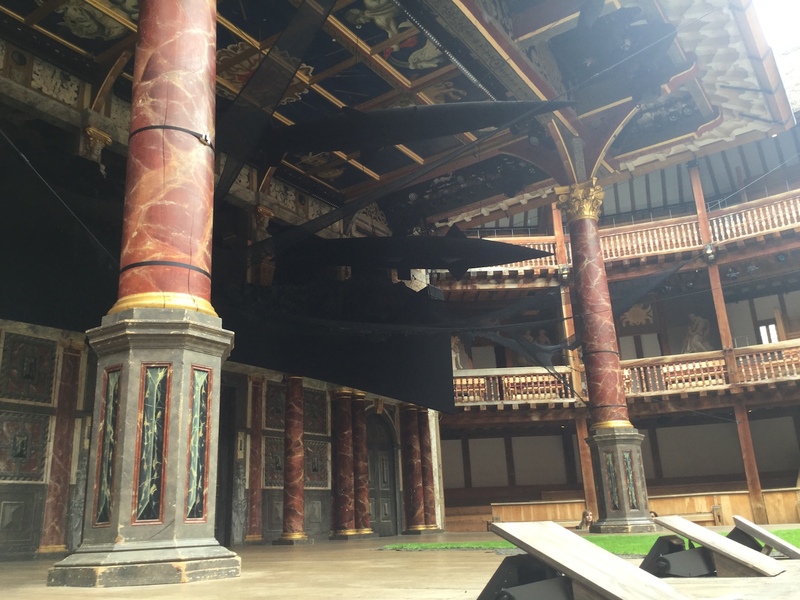 Have you ever been to the Globe – standing or sitting? Have a favorite play by the Bard? What new experiences do you seek out while traveling? I saw Midsummer Night’s Dream there some years ago, seated and with backrests which we hired. Some years before that though when the Globe was still being built we went and had a look around and Zoe Wannermaker was there laying a stone in memory of her father who was instrumental in raising funds for the building. Oh that’s really cool about her being there to lay a stone for her dad. How were the seats? I can’t imagine they would be very comfortable without the cushions and back rests. I thought standing would be misery, especially with all the walking we had been doing, but it wasn’t bad at all. I’d love to see Midsummer Night’s Dream there! Hmmm…I beginning to think the Yard (for the price) wasn’t such a bad option. At least I could take any strain off my feet by lounging on the edge of the stage. At the Burough Market I could not decide between the wild boar tortellini or the pork sandwich…so I both! The pork sandwich was pretty good but not as good as the wild boar tortellini. Romeo and Juliet was fun. Fortunately a few nights before I had read a review in the Evening Standard so I was expecting something different. I think the best performance was Mercutio’s singing, very moving. Yes, her singing alone was worth £5! You forgot the Scandinavian lady with all the pastries…mmmmmmm!!! Oh, amazing! Another great slice of London… And I can’t believe you got to play Banister #1! I think there’s an earlier draft version of “Romeo and Juliet” in which the banister actually saves the day, so it’s a much bigger part than you’d think. 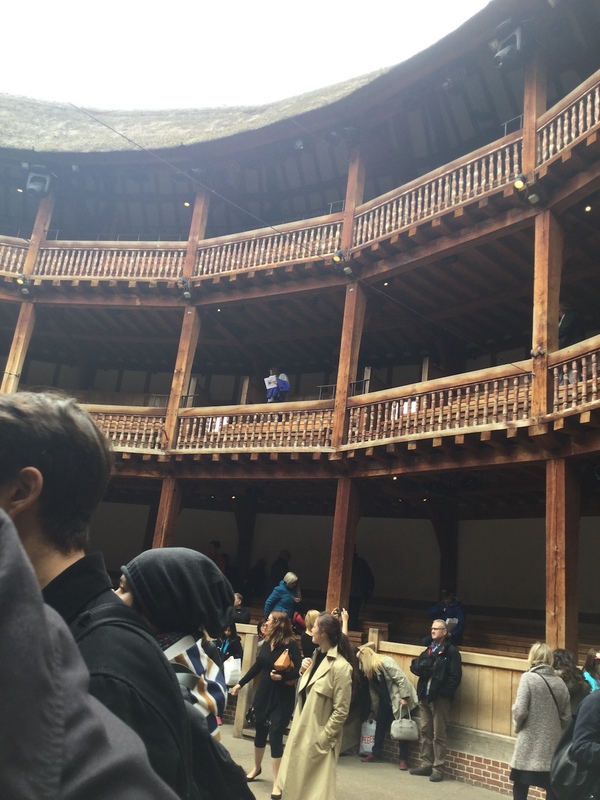 The Globe is so much fun… Although the time I went, we chose to pay extra for the privilege of sitting down because my London-based friend had seen people fainting in the yard on a previous visit. Clearly you and Mr Husband are made of sturdier stuff! From reading another person’s comments, it sounds like sitting might be worse than standing. Yes, we’re tough…or maybe our legs were simply bursting with strength after all our walking and from climbing the Monument. I just knew Banister #1 was an important part. I bet Christopher Marlowe told Shakespeare to remove that bit from the manuscript because he (Marlowe) had already worked up an awesome Banister role in one of his plays. Ah yes, sometimes a rivalry can drive people on to greater things! But alas, in this case it clearly resulted in the loss of a key character from an otherwise great play. As for the seats, I didn’t find them too bad… But I had the foresight to pack a big squishy scarf which I used as a cushion. Knitting saves the day again! Plus I think it rained a little during the performance I went to, so having a roof over my head was a definite plus. Hahaha! I’m impressed… You knew to bring your own costume? You’re a natural!